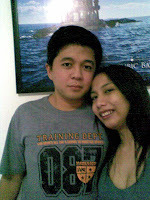 Had my birthday getaway last July 26 to July 29. It was an awesome weekend! Away from the rat-race and the stressful traffic jam in the metro. Went out of town with my boo at Subic's Blue Rock Resort for a rainy swimming. Got the rain, sand and salt waters on our hair and skin. It was fun, specially if you get to spend it with someone closest to your heart.